Our undergraduate courses enable you to tailor your degree to your needs. We offer flexibility and choice, giving you opportunities to gain the transferrable skills employers really want, such as teamwork, leadership and learning another language. Our wide selection of postgraduate taught courses offer you the chance to benefit from intensive teaching while building on the skills and knowledge gained during your first degree. PhD study takes place within a demanding and rigorous research environment. The depth of your personal knowledge will increase and you will be expected to make an independent contribution to knowledge in your field. Our BSc Healthcare: Management, Policy and Research is a pioneering multidisciplinary degree led by internationally renowned healthcare researchers. Our BSc Healthcare: Management, Policy and Research is a pioneering multidisciplinary degree led by internationally renowned healthcare researchers. Our BSc Healthcare: Management, Policy and Research is a pioneering multidisciplinary degree led by internationally renowned healthcare researchers. The BSc Healthcare: Management, Policy and Research has been developed in response to a need for highly skilled leaders in healthcare management, policy development and research. You will receive supervised paid placement throughout year three in a research or healthcare organisation, preparing you for future employment. Teaching will take place in Building 45, close to the Nightingale Building. Midwives make a lasting impact on the lives of women and their families from early pregnancy to the first weeks after birth. When you graduate from Southampton you’ll have a profound understanding of the physiological, sociological and psychological aspects of pregnancy and childbirth. You’ll be able to confidently lead on, provide, evaluate and enhance evidence based maternity care; responding flexibly to the technological advances in today’s complex healthcare environment. 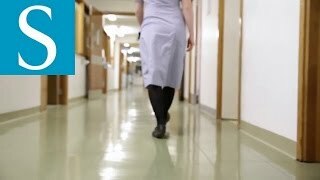 Students experience the highest levels of satisfaction with our teaching* and leave us with eligibility to register as a midwife with the Nursing and Midwifery Council. Those already working as registered adult nurses and wishing to specialise as midwives can take advantage of our two year BSc Midwifery with Advanced Standing. Nursing is a diverse and highly rewarding profession. Whether delivering skilled care to pre-term babies or providing specialist palliative care to those at the end of their lives, nurses provide critical, professional expert help. Whether your interest is child, adult or mental health nursing, or you’re looking to pursue dual-field programmes, at Southampton you’ll be part of a prestigious nursing community ranked top ten in the world*. Our dual field courses offer a Masters degree qualification which gives you an important early career boost and prepares you for the exciting world of clinical academic practice. Occupational therapists help people of all ages with mental, physical or social disabilities caused by illness, ageing or accident to develop independence to carry out key everyday tasks or occupations. Help people with physical and psychological disabilities to live confident and independent lives with our OT programme accredited by the Royal College of Occupational Therapists and the World Federation of Occupational Therapists. Aimed at outstanding, motivated and inspirational students with a commitment to pursuing a career in OT, our BSc Occupational Therapy gives you the opportunity to participate in local, national and international collaborations. The Complete University Guide 2019 ranks our programme 4th in the UK and 1st for research quality. Physiotherapists work with people of all ages and a spectrum of health conditions. They treat problems caused by illness, injury, disability or ageing to improve physical activity and quality of life. Our research-led physiotherapy programmes are aimed at high achievers with a passion for healthcare who want to make a difference in people’s lives. 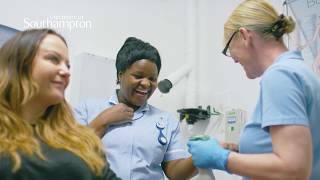 You’ll get hands-on experience using our dedicated practical rooms boasting excellent facilities including a simulated ward with state-of-the-art programmable mannequins and video recording equipment. Our world leading physiotherapy research is continuously being integrated into our education programmes so as a BSc Physiotherapy student you will work alongside internationally acclaimed academics to develop excellent research skills. Physiotherapy at Southampton is ranked 3rd overall and 1st for research quality, Good University Guide 2019. Podiatrists make a positive impact to the lives of people living with the varied conditions that can affect the lower limbs and feet. Become a future leader in podiatric medicine with our research-led BSc Podiatry accredited by the Heath and Care Professions Council and approved by the Society of Chiropodists and Podiatrists. You'll learn in a leading centre of podiatry from a globally respected and passionate team of research-active academics in our superb new clinical podiatry suite. Skills including the mechanical correction of gait and posture, prescribing or making corrective devices to aid mobility and the prevention, diagnosis and treatment of abnormal podiatric conditions comprise just some of the expertise you’ll gain. On graduation students are eligible to apply to register as a podiatrist. Health Sciences research and teaching at Southampton takes place across several locations, including the newly built Nightingale Building, Building 45, and at the Princess Anne Hospital and University Hospital Southampton. Clinical research plays a pivotal role in Health Sciences. Our academics have an excellent reputation for collaborating across the University of Southampton, with other universities, the NHS and charities to uncover new scientific facts. From day one, we encourage our students to evaluate procedures, challenge practice and analyse results, helping them work proactively and with greater initiative and preparing them for clinical leadership. Skills of emotional intelligence, empathy and compassion are fundamental for both students and staff. As a result, members of our community foster a profound appreciation for the human condition. We also work closely with the private sector to develop equipment and techniques for the future. All these things add up to a truly progressive ethos, which is why governmental bodies from around the world come to us for advice on healthcare policy. Choosing a postgraduate diploma or masters degree with us offers the gateway to top-level positions in healthcare. Our nursing ranks ninth in the world,* and we’re recognised as first in the UK for the quality, impact and intensity of our research**. Choose from advanced clinical practice programmes, leadership and specialist degrees in areas such as physiotherapy and neonatal medicine, as well as professional development courses and tailored options designed to fit your precise career path. At Health Sciences everything we do is powered by our world-class research*. Our themes include cancer, palliative and end of life care, active living technologies, healthcare workforce, self-management and complex conditions, ageing and dementia, continence and skin health. Aimed at nurses, midwives, physiotherapists, occupational therapists, podiatrists, health scientists, psychologists and social scientists, our PhD research doctorates will help you develop the skills for high-level healthcare research. You’ll be supported by two expert academics with experience in your area of study. Our Clinical Doctoral Research Fellowship Scheme is for early career nurses, midwives and allied health professionals, aspiring to become clinical academic leaders. You will be embedded in a leading research group at the University’s main campus or at our purpose-built clinical academic facility based at University Hospital Southampton. Your PhD research is agreed by you, the University and the relevant Trust and will address a key research priority for both organisations.